Biscotti are one of those things my grandmother used to make for me and I remember the last time she was well and she baked me a huge batch of them. She included a pinch of cinnamon and a smidgen of nutmeg and so I’ve included those things here but you don’t have to include them. They are, however, one of my favourite and most abiding memories of my late paternal grandmother and I hope that when you make them, they bring love to your family or just your belly as well. Remember it is essential to double bake these because you need to dry them out to get that lovely crunch. If you’d like to add something special, dip half the biscotti in melted chocolate and possibly decorate in chopped hazelnuts. Line a baking sheet with baking parchment (I get mine from Lakeland or Sainsbury’s). In a large bowl, sift together the flour, salt, cinnamon, nutmeg and baking powder. Add in to the mix the ground hazelnuts and sugar and mix in with a fork. Beat the egg into this mix, then once stiff bring together the dough with your hands until smooth. Once the dough is smooth, add the chopped hazelnuts and incorporate them into the mix well but don;t overwork the dough at this point. Roll the dough in to the shape of a rounded but flattened sausage. It should be about 5cm wide and think about the biscotti shape. The bottom of the flattened sausage is the flat side of the biscotti and the rounded top is that beautiful rounded part of the biscotti. We are going to cut this shape into fingers later. Place the dough on to the parchment paper on the baking tray. The initial bake is for 25-30 minutes until the dough feels firm to the touch. Remove the flattened baked sausage shape from the oven and leave to cool for 10 minutes so it firms up a bit. Turn the oven down to 140C or 130C fan. Slice the flattened sausage on the diagonal using a bread knife or a very very sharp knife but it might squish the cookie. 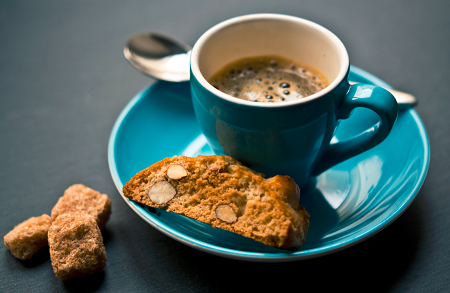 You will want your biscotti to be about 1cm thick in order to properly dry out. Place the cut biscotti on their ‘side’ exposing the side you just cut through so the inside dries out on the baking tray and bake for 8-10 minutes. Flip the biscotti over and bake on the other side for 8-10 minutes until firm. This is intended to dry the inside of the biscotti out so remember this when baking. When the biscotti are cool, melt the chocolate in a bowl placed over a pan off simmering water. Dip the biscotti halfway into the melted chocolate and place back on the wire rack. Before it cooks, sprinkle with chopped hazelnuts, chocolate shavings or anything really. Leave the chocolate to set them serve and enjoy!